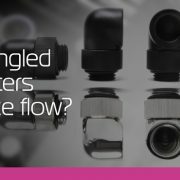 Do angled adapter fittings really reduce flow? Probably one of the most quoted pieces of advice on building a liquid cooling loop is “don’t use many angled adapters, they reduce your flow rates”. So, is it true? https://www.ekwb.com/wp-content/uploads/2015/12/Angled_adapters_flow.jpg 370 705 Atila Gobor https://www.ekwb.com/wp-content/uploads/2015/12/ekwb_logo.png Atila Gobor2016-11-04 12:45:252017-03-23 14:52:11Do angled adapter fittings really reduce flow?